The average Westerner … was wont to regard Japan as barbarous while she indulged in the gentle arts of peace: he calls her civilized since she began to commit wholesale slaughter on Manchurian battlefields. Kakuzo Okakura, The Book of Tea, 1906The controversy that erupted in March over the publication of Charles Pellegrino’s account of the atomic bombings of Japan, The Last Train from Hiroshima, suggests that the historical legacy of the first military use of atomic weaponry is still fiercely contested in the USA. The spat is merely the latest conflict in a long war over the significance of the bombings, which resurfaces with each new book, exhibition or programme that appears. When the ruins of the Genbaku (Atomic Bomb) Dome – formerly the Hiroshima Prefectural Commercial Exhibition Hall – were nominated as a UNESCO World Heritage Site in 1995, the United States objected on the basis of concerns over a ‘lack of historical perspective’, arguing that the ‘events antecedent to the United States’ use of atomic weapons to end World War II are key to understanding the tragedy of Hiroshima’. The appeal to historical facts by both US diplomats and, more recently, military veterans contrasts with the dehistoricized emphasis of other Western cultural responses to Hiroshima. But what both kinds of reception share is an occlusion of the prehistory of capitalist liberalism, colonialism and imperialism which produces Japanese modernity, a prehistory which is itself built into the Genbaku Dome’s concrete structure, and an afterlife of nuclear pacification which produces the global context of terrorism as the continuation of war by other means. The Aioi Bridge spans the point where the Kyu Ota and the Motayasu rivers converge in downtown Hiroshima, resulting in its distinctive T-shape where it connects three abutting sections of land. This feature marked it out as the visual target for the bombing raid on 6 August 1945. Because of its proximity to the bridge, and because the atomic bomb was slightly off-target, what was then the Hiroshima Prefectural Industrial Promotions Hall was almost directly beneath the atomic blast when the bomb exploded in the air above the city. The 120 governmental and related staff working inside the building were all killed instantly, but the shell of its central structure remained largely intact, in part because of its location beneath this downward (rather than sideways) blast of the explosion, but also because of its Western-style design, utilizing steel and concrete reinforcing. Flames blew from the dome which crowned the central section of the Hall, melting the copper plating to leave only a skeletal steel skull. But these alternative experiences tend to be occluded by the dominance of that testified to in the UNESCO statement, which enacts a series of transitions from the ephemeral and particular to the eternal and universal, from the inexperienceable and supposedly unrepeatable magnitude of destruction and suffering to its aesthetic exhibition, and from war to peace. This article focuses on one particular consequence of this view: the conceptual tendency to elide war and peace through an ideology of progress, which works to silence cultural critique. In order to resist the continuing reception of Hiroshima according to an idealist philosophy of historical progress, the following seeks to juxtapose this preand after-history to construct an image of the Dome as the ground zero of our current ‘war on terror’. This serves to supplement some broader reflections on the ideological function of what will be termed the ‘historical sublime’, which codes the aesthetic reception of the Genbaku Dome in the West and underpins the idealist philosophy of history. A suggestion for the construction of a commercial exhibition hall – in which the newly produced commodities manufactured in the city and its surrounding areas could be displayed and sold – was first put forward after the end of the Russo-Japanese war in 1905, but postponed due to inadequate funding. In 1910 a joint proposal to finance the construction of the hall on land owned by the city using funding provided by the prefecture was agreed, and over the next few years the General Affairs Division of the Hiroshima City Hall set about purchasing, acquiring and exchanging land for the site on the banks of the Motayasu river. Preparation work began on 1 April 1911 and proceeded at a steady pace for the next two years. In 1940, with the agreement of the Vichy government of France, Japan occupied French-controlled Vietnam, joining forces with the German–Italian Axis. Most of the smaller, wooden traditional Japanese-style structures that surrounded the Hall when the atomic bomb was dropped were either instantly destroyed by the thermal blast or in the subsequent firestorm that razed the city (90 per cent of Hiroshima’s houses were tightly clustered wooden dwellings). In her excellent book Hiroshima Traces, Lisa Yoneyama records that of the 142 major public buildings within 5 kilometres of the central blast area, around 80 survived the bombing. 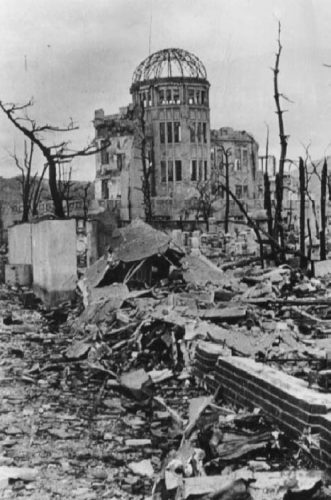 In the aftermath of the war, there were calls to halt postwar development and leave the ruins of Hiroshima completely untouched, but commercial interests ensured that redevelopment of the city commenced. The prefecture had allocated financial resources for the reconstruction of the building in the 1950s, but concerns that it was dangerously close to collapse meant the funds were returned and in 1953 the ruins were donated to the city. Hibakusha (A-Bomb survivor) groups were initially divided over whether to remove or preserve such reminders, although many did later petition for the Dome’s preservation. As the preservation movement grew stronger a wire fence was erected to seal off the building, and, after architectural surveys and a budgeting of funds, Hiroshima City Council finally passed a resolution for the preservation of the structure on 11 July 1966. How the skeletal shell of the devastated ruin might serve as any kind of universal monument for UNESCO, let alone one capable of symbolizing perpetual peace, becomes comprehensible if the series of transitions enacted in its description are understood in relation to a concept of the historical sign coded by a Kantian aesthetics of the historical sublime. Kant insists that it is not the object that should be classed as sublime but the rational Idea evoked within us, which the object is merely suitable for exhibiting. In the mathematical sublime, it is our incapacity to estimate aesthetic magnitudes beyond the limits of sensible intuition that provokes the imagination to turn to the numerical concepts of the understanding, capable of successively advancing to infinity. Reason, however, ‘seeks to approximate the unity that is possible empirically’, and demands ‘a multiplicity in a unity (of intuition rather than thought)’. This felt compulsion to collapse the temporal condition of the infinite into the simultaneity of an instant nonetheless indicates a supersensible power within us, Kant argues, which points to the nonempirical and ideal ground of magnitude: the absolute and unconditioned whole of nature (CJ 255). Robert Ginsberg focuses on ‘the terrible dynamism’ of the explosion still ‘pressed into the stone’, which forces itself upon ‘the human heart’. Kant’s description of the dynamic sublime evokes our physical impotence before the destructive power of nature precisely in order to recover our supersensible superiority over it. The mathematical conflict between the sensible and the rational is reduplicated here between the spectator’s imagined fear, associated with empirical self-preservation, and an excited fearlessness which reveals our practical vocation: a higher human dignity, connected to the Idea of freedom, that endures above our empirical concerns with ‘property, health, and life’ (CJ 261–2). There is, however, a problem with the antinomy on which Kant’s argument hinges: there is nothing contradictory in being able to imagine a freedom from the danger of nature when – from the perspective of a safe distance necessary for the experience of the sublime – the individual is ‘free’ from such danger. In other words, the higher practical freedom Kant seeks to rescue with his appeal to the sublime is the result of an imaginative mislocation. Kant’s anticipation of such an objection compounds the error by turning the fallacy into a virtue: the ‘liking concerns only our ability’s vocation, revealed in such cases, insofar as the predisposition to this ability is part of our nature’, he responds, ‘whereas it remains up to us, as our obligation, to develop and exercise this ability’ (CJ 242). This problem repeats itself in Kant’s discussion of the ‘historical sign’. Indeed, to properly understand the elisions involved in the reception of the Dome it is necessary to understand how this aesthetics of the sublime, with its flight from empirical destruction to the Idea of freedom, implicitly structures an idealist conception of history. In the ‘Idea for a Universal History from a Cosmopolitan Point of View’, Kant utilizes a teleological argument to the effect that since humanity as a species possesses a unique capacity for practical reasoning, we must assume the species is to develop in accordance with this rational purpose and its political organization, becoming increasingly autonomous. If the historian is unable to find any evidence of such regularity and lawfulness in collective human action, we must therefore attribute this to our cognitive limitations and look for indirect signs of such purposiveness in nature itself (IUH 42). Kant discovers this in the principle of ‘unsocial sociability’, which is responsible for the competitive drive through which individuals and nations seek to develop their talents and progress in culture, taste and enlightenment (IUH 45). War is the international expression of this ‘pathological y enforced social union’, and therefore the necessary precondition for the eventual cooperation of nations in a great, cosmopolitan federation of states (IUH 47–8). The second part of the Conflict of the Faculties develops this account by drawing on Kant’s attitude towards the revolution in France and his account of the sublime to theorize the further existence of a ‘historical sign’ itself. This would demonstrate a purposive tendency in the human race as it is currently divided into nations and states, one ‘undetermined with regard to time, and which would allow progress toward the better to be concluded as an inevitable consequence’. It is not the revolution in France that is itself progressive, however, although we might say it is suitable for exhibiting the moral character in the mind of the spectator who enthusiastically follows the events from a distance. It is the excitement of the spectator, with its universal but disinterested sympathy for the actors, which for Kant indicates its innate, moral character. The problem of imaginative mislocation threatens to repeat itself here in the distancing from any analysis of the empirical, material and historical conditions of conflict and struggle, which permits claims of progressiveness to be indiscriminately attributed to all sorts of historical events. Furthermore, the Truman administration promoted the bombings of the largely civilian populations of Hiroshima and Nagasaki as helping save a million American lives, an idea that is often expanded to include also the Japanese lives ‘saved’ by the avoidance of invasion. An imaginative mislocation is again involved here, and whilst the development of the bomb is justified as necessary against an imagined atomic attack by Germany, its deployment is justified against an imagined invasion of the Japanese mainland by America. Two significant factors are at stake in such a response to the bomb. Robert Jay Lifton has argued that for the Japanese there is a psychological comfort enacted in the equation of destruction and peace: ‘the general tendency to use “Atomic Bomb” and “Peace” almost interchangeably in naming these monuments suggests the psychological effort to equate the two in the sense of the latter springing from the ashes of the former’. This comfort is problematic since it has a tendency to pass over issues of Japanese nationalism and imperialism, particularly relevant given Hiroshima’s status as a military capital during the imperial expansion into Asia. At the same time, this Japanese response to the events has certainly been encouraged by the Allied countries, for whom this equation of war and peace serves as a moral justification for the use of indiscriminate atomic weaponry against a civilian population and the basis for a rhetoric of pacification. This obscures both the West’s involvement in what Kakuzo Okakura’s epigraph sardonically calls the ‘civilizing’ of Japan and the Far East and its continuing involvement in such projects in the Middle East. Three theoretical implications of such a response will be discussed here, and justified in the context of the cultural reception of the bombing: 1. The ‘universalizing’ of such responses, which encourages both the homeward movement of suffering in the American imagination and, consequently, its expansion to a ‘globalized humanity’, which works to conceal ongoing political divisions.2. The ‘naturalizing’ of the response, which posits a ‘timelessness’ that prioritizes the mythical over the historical and induces a fatalism into the concept of progress, which reverberates in the myth of pacification.3. The ‘idealism’ of such arguments, which involves a problematic concept of freedom derived from the dualism between ‘nature’ and ‘history’. This dualism posits the bombing as historically and technologically unique and obscures the continuity of violence inherent to such pacification. This little act of care is supposed to suggest that the suffering wrought by the bomb enables a kind of universal humanity to emerge amid the devastation. This pattern is repeated in the more recent and overtly psychological works on Hiroshima, which have a tendency to universalize the suffering through the deployment of Jungian archetypes. Here, the Kantian sublime and its cosmopolitan humanity are rejuvenated via the Jungian theory of the collective unconscious. Michael Perlman’s Imaginal Memory and the Place of Hiroshima is indicative of such a response, arguing as it does that images associated with the place of Hiroshima embody unsuspected psychological values beyond their role as reminders of the concrete horror of nuclear war. The remembering of these values is crucial to a deeper-going commitment to peace and to contemporary psychological life in general. What is troubling about Perlman’s efforts to find what he calls a ‘home’ for the mnemonic images of the dead is the way in which the memories of the Japanese victims are ‘re-housed’ primarily within the paradigms of Western culture: the mythical landscape of ancient Greek legend. For example, the wounds of Father Kleinsorge that repeatedly reopen are connected with the pain and suffering of Dionysus, whilst Kiyoshi Tanimoto becomes the ferryman piloting the vessel of the dead. Perlman concludes by evoking the ‘timeless’ theogonic time of Hesiod’s Muses, arguing that commemorating Hiroshima in this way encourages a ‘universality’ which becomes utterly inclusive only by its obliteration of boundaries and forgetting of nationalism. In Perlman’s version the particular is transformed into the universal, nationalism turns into cosmopolitanism, and because we all become the ‘victims’ of Hiroshima, war – to use one of Perlman’s favoured images from Jung – alchemically transmutes into the stimulus for peace. One of the problems with Kant’s account of the dynamic sublime is that the humanity and immortality evoked by destruction depend upon a conflict between empirical self-interest and a higher disinterest, which, because it is merely imagined, may have an existence that is merely imaginary. Despite the author’s intentions, Perlman’s ‘imaginal memory’ or Lifton’s ‘species consciousness’ threaten to reassert national self-interest at a global level under the guise of international humanitarianism. Thus, for Lifton, species consciousness is ‘not just a distant ideal but a practical and realizable state of mind’, which is manifested in the ‘principle of ‘common security’ – of no nation being secure unless all are’. The humanity imagined in Kant’s sublime arises out of a violent act of reduction. In Hersey’s Hiroshima, the points of identification dramatized are small acts of generosity, heroic exploits of bravery, merciful gestures of compassion, and the calmly described horror of individuals reduced to bodies stripped of skin, clothing, property, language and other such distinguishing marks: aggression, nationalism and politics are beaten out of its victims. This produces a mythological concept of humanity, a pacified humanity that arises as a consequence of imperial warfare and not one that posits, even if it must be through violent struggle, any genuine alternative to it.This risk is exacerbated by the fatalism attached to the naturalizing of historical events. Expressions of such fatalism by the victims is frequently reported in the American literature, encapsulated in the Japanese phrase Shikata ga nai: ‘It can’t be helped’. Similarly, the novelistic form of Hersey’s Hiroshima article, which interweaves the different perspectives of six survivors, induces a kind of temporal repetition whose moment of simultaneity is centred on the millisecond of the explosion like an inevitable catastrophe. But it is also implicit in the more recent responses to the suffering. Perlman describes his ‘devotional’ practice of memory as involving a painful masochism reminiscent of the medieval submission to the powers of Fate. Just as in the mathematical sublime Kantian reason demands a simultaneity which steps outside the additive temporal progression into infinity, so in the historical sublime the past is brought into simultaneity with the present in a way which does not pragmatically emphasize the contingency of the present, but eternalizes the present in its empathetic rehousing of what has occurred. The mythological concept of fate tacitly utilized in such responses to the bomb facilitates the recasting of the city and its people as the sacrificial victims of a higher progress: the inevitable cause of peace. However, the peace brought about by the bombing of Hiroshima and Nagasaki was a silence enforced by an act of violence designed to be so brutal it would shock the government, its people and the wider world into submission. Those who take up the memory of the victims as a universal stimulus to continued global cooperation and security seem to possess a peculiarly mythological understanding of pacification, one shared with those who insist on the necessity of the bombings of both Hiroshima and Nagasaki for the end of the Second World War. Their peace is the present conclusion of history as it is narrated by the victors, one that smooths over the legacy of imperialist violence and economic liberalism. It is only at a superficial level that the remembered or imagined threat of atomic or nuclear annihilation might provoke an appeal to human dignity, because the humanity it hopes to evoke is undermined by the very technological and hence human-made status of the destruction it reflects upon. In the Kantian sublime it is the common response to a natural threat that engenders a sense of indestructibility by distinguishing us from empirical nature. Consequently, because the Kantian concepts of freedom and history depend upon a dualism that has a tendency to exclude the technological, contemporary reflection upon destructive technology necessitates the introduction of a further dualism at the level of the rational and historical, if the affirmative flight into idealist progress be retained. The value of the word ‘exactly’ is significant here. It encapsulates the triumph of technology, from the Manhattan Project scientists that developed the first atomic bomb, the refitted B-29 bombers that carried it, the watches that timed the explosion, and the photographic equipment that captured the mushroom cloud. The experience of technological sublimity evoked in such responses to the event of Hiroshima therefore works to conceal rather than expose the historical continuity of atrocities carried out on all sides during the last world war. Robert McNamara, at the time a captain in the Army Air Forces’s Office of Statistical Control, has suggested that the efficiency of the firebombing of major Japanese cities had already rendered the necessity of atomic weaponry redundant, and that the subsequent devastation caused by the attacks on Hiroshima and Nagasaki may have been disproportionate enough to justify General LeMay’s prosecution as a war criminal. The sublimity attached to Hiroshima is in this sense an act of reassurance: the bombing becoming an abnormality whose conditions may be pored over in scholarly detail, whilst those implicated as responsible remain comfortingly small in number. Hiroshima was spared the intensive fire-bombing campaigns that devastated other Japanese cities in the first six months of 1945 because the city had already been nominated as a possible target for an atomic attack. Among the factors contributing to the selection of Hiroshima were its importance as a military and industrial base, the absence of any significant number of Allied prisoners of war, the absence of surrounding hills which may contribute to containing the effects of the blast (and therefore limit the quantifiable extent of the devastation), and the presence of a large number of homes and buildings useful for measuring the magnitude and strength of the explosion (and which had been intentionally spared from conventional bombing for this purpose). Hannah Segal suggests that ‘the 11th September bombing was highly symbolic’ because it served as a counterexample to the notion that because of America’s technological sophistication, its ability to wage war from a distance, from the sky and not the ground, it could remain invulnerable. Despite the sophisticated levels of information, planning and communication required to carry out attacks such as those on New York, Madrid or London, the attacks themselves were technologically crude in their method. The lack of technological sophistication is in turn a reflection of the geopolitical situation out of which terrorism is waged. For, regardless of the extent to which terrorism can be traced back to supposedly ‘external’ ideologies and foreign countries, the capacity to wage terrorist attacks effectively relies on the ability to threaten its target internally, from within. Moreover, this disruption of the geographical supremacy of nuclear totalization effects the very ‘uselessness’ of nuclear technology. Nuclear warfare cannot be actual y used against an enemy within, nor – outside of the context of a world war which nuclear weaponry has supposedly rendered impossible – at an enemy scattered within another population. The political essayist Dwight Macdonald, editor of the Marxist journal Politics, lambasted the early glorifications of Hiroshima and Nagasaki in a series of articles published between August 1945 and November 1946 which suggested that atomic power had rendered the very concept of ‘progress’ obsolete. Both socialist and conservative responses to atomic power, Macdonald argued, rested on a platitude about atomic fission ‘based on a faith in Science and Progress’, a belief which ‘blunts our reaction to the present horror by reducing it to an episode in an historical schema which will “come out all right” in the end’. Against the utopianism of progress, he admonishes that ‘we do not dream of a world in which atomic fission will be “harnessed to constructive ends”’, for the ‘new energy will be at the service of the rulers; it will change their strength but not their aims’. 1. ^ Concerns about its veracity were raised, among others, by the Veterans of the 509th Composite Group, who flew the bombers involved in the raids on Hiroshima and Nagasaki (www.enolagay509th.com/Veterans509th.pdf). Publication was halted, forcing Hollywood director James Cameron, who had optioned the book in preparation for a forthcoming film on Hiroshima (clearly recognizing the potential for another sentimentalized techno-hubristic romance), to speak out in defence of the author, whom he had previously employed as ‘scientific’ consultant on Titanic and Avatar. ‘Avatar Director James Cameron Defends Hiroshima Author’, BBC News, 4 March 2010, http://news.bbc.co.uk/1/hi/entertainment/8549036.stm. 2. ^ Annex V, 20th session of the UNESCO World Heritage Committee, 1996, http://whc.unesco.org/archive/repco96x.htm. 3. ^ The term ‘ground zero’, which resurfaced in the aftermath of the 2001 attacks on the World Trade Center, originated as a military term to describe the hypocentre of the explosion used by the scientists of the Manhattan Project. 4. ^ Shinobu Amano Kikuraku, ‘From A-bomb damage to repair’: ‘History of the A-Bomb Dome’, http://ww2.enjoy.ne.jp/~kikuraku/files/history4.htm. 5. ^ Lisa Yoneyama, Hiroshima Traces: Time, Space, and the Dialectics of Memory, University of California Press, Berkeley and London, 1999, p. 20. 6. ^ UNESCO World Heritage List No. 775, Hiroshima: Nomination of Hiroshima Peace Memorial, 28 September 1995, www2.unitar.org/hiroshima/programmes/whs07/materials/Utaka- [archive]%20ABD_and_Itsukushima.pdf, p. 3. 7. ^ Ibid., p. 1. 8. ^ Hugh M. Gloster, ‘Hiroshima in Retrospect’, Phylon, vol. 17, no. 3, 1956, pp. 272, 278; Robert Jay Lifton, Death in Life: Survivors of Hiroshima, University of North Carolina Press, Chapel Hill, 1991, p. 278. 9. ^ Richard Sims, Japanese Political History since the Meiji Restoration: 1868–2000, Hurst, London, 2001, p. 1. Weidenfeld & Nicolson, London, 1995, pp. 51–2. 11. ^ Chushici Tsuzuki, The Pursuit of Power in Modern Japan: 1825–1995, Oxford University Press, Oxford, 2000, p. 63. 12. ^ Jean-Pierre Lehman, The Roots of Modern Japan, Macmillan, London, 1992, p. 174; Richard Storry, A History of Modern Japan, Penguin, London, 1990, p. 122; Lehman, The Roots of Modern Japan, p. 174. 13. ^ Christine M.E. Gruth, ‘Japan 1868–1945: Art, Architecture, and National Identity’, Art Journal, vol. 55, no. 3, Autumn 1996, p. 17; Storry, A History of Modern Japan, p. 107. 14. ^ Tsuzuki, The Pursuit of Power in Modern Japan, p. 72. A similar mill in Osaka sought farm girls, who were housed in company dormitories and worked up to twelve hours a day in conditions where tuberculosis was rife (ibid., p. 147). 15. ^ Storry, A History of Modern Japan, p. 107; G.B. Sansom, The Western World and Japan, Cresset Press, London, 1950, p. 401, cited in ibid., pp. 107–8. 16. ^ Pyle, The New Generation in Meiji Japan, p. 173, cited in Tsuzuki, The Pursuit of Power in Modern Japan, p. 37. 17. ^ Lehman, The Roots of Modern Japan, p. 174. 18. ^ Beasley, The Rise of Modern Japan, p. 111. 19. ^ Shinobu Amano Kikuraku, ‘Making of the Hiroshima Prefectural Commercial Exhibition Hall’, History of the A-Bomb Dome, http://ww2.enjoy.ne.jp/ [archive]~kikuraku/files/history1.htm. 20. ^ Shinobu Amano Kikuraku, ‘Commercial Exhibition Hall and Jan Letzel’: ‘History of the A-Bomb Dome’, http://ww2.enjoy.ne.jp/~kikuraku/files/history2.htm. 22. ^ In the period 1870–1914, among the major industrial powers – the UK, Germany, France, the USA and Japan – Japan’s annual rate of growth was second only to that of the United States (Lehman, The Roots of Modern Japan, p. 181). 23. ^ Cf. Crawcour, ‘Industrialization and Technological Change, 1985–1920’, The Cambridge History of Japan, vol. 6, Cambridge University Press, Cambridge, 1988, p. 436. 24. ^ Between 1914 and 1918, Japan’s real gross national product rose by 40 per cent (Tsuzuki, The Pursuit of Power in Modern Japan, pp. 193–4). Between 1915–1919 manufacturing output related to heavy industry and machinery increased by 72 per cent, with labour employment increasing by 42 per cent. Between 1909 and 1929 manufacturing relating to textiles almost quadrupled, to metals and machinery grew about the same, to chemicals and ceramics increasing around eight-fold, and to electricity and gas around twentyfour-fold (Beasley, The Rise of Modern Japan, p. 111). 25. ^ Tsuzuki, The Pursuit of Power in Modern Japan, p. 188. 26. ^ Ibid., p. 189. 27. ^ UNESCO World Heritage List No. 775. 28. ^ Ibid; cf. also Kikuraku, ‘Commercial Exhibition Hall and Jan Letzel’. 29. ^ Shinobu Amano Kikuraku, ‘Transformation of the Hall’, History of the A-Bomb Dome, http://ww2.enjoy.ne.jp/~kikuraku/files/history3.htm. 31. ^ Tsuzuki, The Pursuit of Power in Modern Japan, p. 233. 32. ^ Joseph Gerson, Empire and the Bomb, Pluto Press, London and Ann Arbor MI, 2007, p. 44. 33. ^ Kikuraku, ‘Transformation of the Hall’. 34. ^ Storry, A History of Modern Japan, p. 188. 35. ^ Ibid., p. 294. 36. ^ Kikuraku, ‘Making of the Hiroshima Prefectural Commercial Exhibition Hall’. 37. ^ Harry D. Harootunian, Overcome by Modernity: History, Culture, and Community in Interwar Japan, Princeton University Press, Princeton NJ, 2000, p. 293. 38. ^ Lebra, Japan’s Greater East Asian Co-Prosperity Sphere, pp. 78–81; quoted in Beasley, The Rise of Modern Japan, p. 204. 39. ^ Harootunian, Overcome by Modernity, p. 34. 41. ^ Gordon Thomas and Max Morgan-Witts, Ruin from the Air: The Atomic Mission to Hiroshima, Hamish Hamilton, London, 1977, p. 323. 42. ^ Kyo Maclear, Beclouded Visions: Hiroshima–Nagasaki and the Art of Witness, SUNY Press, Albany NY, 1999, p. 51. 43. ^ Although Yoneyama notes that during the late 1960s ‘survivors were known to be generally less supportive of retaining this painful visual reminder of destroyed buildings’ (Yoneyama, Hiroshima Traces, p. 70). 44. ^ Immanuel Kant, Critique of Judgement, trans. Werner S.
45. ^ Immanuel Kant, Critique of Pure Reason, trans. Werner S. Pluhar, Hackett, Indianapolis, 1996, Ak. A567/B595; CJ 258. 46. ^ Quoted in Thomas and Morgan-Witts, Ruin from the Air, p. 432. 47. ^ Robert Ginsberg, ‘Aesthetics in Hiroshima: The Architecture of Remembrance’, in Michael H. Mitias, ed., Philosophy and Architecture, Rodopi, Amsterdam, 1994, p. 223. 48. ^ Cf. Frances Ferguson, ‘The Nuclear Sublime’, ‘Nuclear Criticism’, Diacritics, vol. 14, no. 2, Summer, 1984, p. 7. University of Nebraska Press, Lincoln, 1992, p. 148. 50. ^ Ibid., p. 153. 51. ^ Ibid., p. 171; cf. Kant, ‘Perpetual Peace: A Philosophical Sketch’, in Kant: Political Writings, pp. 93–130. 52. ^ Norman Cousins, The Saturday Review of Literature, 5 March 1949, quoted in John Hersey, in Hiroshima (1946), 2nd edn, Penguin, Harmondsworth, 1986, pp. 176–7. 53. ^ Hersey, Hiroshima, p. 181. 54. ^ Cf. Paul Boyer, By the Bomb’s Early Light: American Thought and Culture at the Dawn of the Atomic Age, University of North Carolina Press, Chapel Hill, 1994, pp. 111–14. 55. ^ Paul W. Tibbets, with Clair Stebbins and Harry Franken, The Tibbets Story, Stein & Day, New York, 1978, p. 230. 56. ^ Ibid., pp. 1–2. Former secretary of war Henry L. Stimson published an article in Harper’s magazine early in 1947, in which the claim is made that the atomic attacks had prevented the one million American casualties anticipated in the invasion of Japan, repeating a claim made by Churchhill (Joseph Gerson, Empire and the Bomb, Pluto Press, London and Ann Arbor MI, 2007, p. 47). Truman later drew upon Stimson’s explanation, but halved the figure. Paul Tibbets repeats these figures in his biography, observing that, ‘Depending on whose estimates you accept, the atomic bombings of Hiroshima and Nagasaki saved a half-million or possibly a million lives, both American and Japanese.’ Historical research now shows that the pre-surrender estimates never exceeded 20,000, and the worst-case prediction estimated a loss of no more than 46,000 lives (J. Samuel Walker, ‘The Decision to Use the Bomb: A Historiographical Update’, in Michael J. Hogan, ed., Hiroshima in History and Memory, Cambridge University Press, Cambridge, 1996, p. 11). 57. ^ Lifton, Death in Life, p. 271. 58. ^ Yoneyama notes how hibakusha invoked this argument of inappropriateness during the first stage of preservation during the late 1960s, cf. Yoneyama, p. 70; and Hibaku Kenzobutsu o Kangaeru Kai, ed., Hiroshima no hibaku kenzobutsu: hibaku 45shunen chosa hokokusho, Asahi Shinbun Hiroshima Shikyoku, Hiroshima, 1990, pp. 121–2. 59. ^ ‘Hersey’s essay had an immediate and profound impact. The book version became a runaway best-seller. The Book-of-the-Month Club distributed free copies to many of its 848,000 members. A reading of the entire work, in four half-hour segments, over the ABC radio network won the Peabody Award for the outstanding educational broadcast of 1946’ (Boyer, By the Bomb’s Early Light, p. 204). 60. ^ Hersey, Hiroshima, p. 70. 61. ^ Michael Perlman, Imaginal Memory and the Place of Hiroshima, SUNY, Albany NY, 1988, p. viii. 62. ^ Ibid., p. 82. 63. ^ Ibid., pp. 87 and 118. 64. ^ Ibid., p. 160. 66. ^ Lifton, Death in Life, p. 14. 67. ^ Ibid., p. 294. 68. ^ Ibid., p. xii. 69. ^ ‘As for the use of the bomb, [Mrs Nakamura] would say, “It was war and we had to expect it.” And then she would add, “Shikata ga nai”, … “It can’t be helped. Oh, well. Too bad.” Dr. Fujii said approximately the same thing about the use of the bomb to Father Kleinsorge one evening, in German: “Da ist nichts zu machen. There’s nothing to be done about it”.’ (Hersey, Hiroshima, p. 117); ‘Perhaps the best example of this difficulty is the attitude of resignation (akimare) and of “it can’t be helped” (shikataganai or shoganai) expressed to me by large numbers of hibakusha’ (Lifton, Death in Life, pp. 186–7); ‘One one occasion a gentleman acquaintance, while talking about the use of the A-Bomb and the outcome of the war, fatalistically declared, “Shi-Kata ga nai” (“It can’t be helped”)’ (Gloster, ‘Hiroshima in Retrospect’, p. 274). 70. ^ Perlman, Imaginal Memory and the Place of Hiroshima, p. 144. 71. ^ Thomas and Max-Witts, Ruin from the Air, pp. 423, 427. 72. ^ Hersey, Hiroshima, p. 32.
men, women, and children … 50 square miles of Tokyo were burned. Tokyo was a wooden city, and when we dropped these firebombs, it just burned it … And he went on from Tokyo to firebomb other cities. 58% of Yokohama. Yokohama is roughly the size of Cleveland. 58% of Cleveland destroyed. Tokyo is roughly the size of New York. 51% percent of New York destroyed. 99% of the equivalent of Chattanooga, which was Toyama. 40% of the equivalent of Los Angeles, which was Nagoya. This was all done before the dropping of the nuclear bomb, which by the way was dropped by LeMay’s command.’ (Errol Morris, director, The Fog of War: Eleven Lessons from the Life of Robert S. McNamara (Sony Pictures, 2004), transcript available at www.errolmorris.com/film/fow_transcript.html [archive]). My thanks to Peter Kapos for drawing my attention to this. 74. ^ Storry, A History of Modern Japan, p. 122; Lehman, The Roots of Modern Japan, p. 228. 75. ^ ‘Why was it necessary to drop the nuclear bomb if LeMay was burning up Japan? … Proportionality should be a guideline in war. Killing 50% to 90% of the people of 67 Japanese cities and then bombing them with two nuclear bombs is not proportional, in the minds of some people, to the objectives we were trying to achieve. I don’t fault Truman for dropping the nuclear bomb. The U.S.–Japanese War was one of the most brutal wars in all of human history … Was there a rule then that said you shouldn’t bomb, shouldn’t kill, shouldn’t burn to death 100,000 civilians in one night? LeMay said, “If we’d lost the war, we’d all have been prosecuted as war criminals.” And I think he’s right. He, and I’d say I, were behaving as war criminals. LeMay recognized that what he was doing would be thought immoral if his side had lost. But what makes it immoral if you lose and not immoral if you win?’ (Morris, The Fog of War). 76. ^ Thomas and Morgan-Witts, Ruin from the Air, pp. 433, 435. 77. ^ Hersey’s additional chapter corrects this omission, detailing the psychological and physiological effects of ‘A-Bomb Disease’. Apart from a discussion of the archetypal images of ‘unhealing wounds’, where he includes the ‘disintegrative processes in the body resulting from radiation sickness’, Perlman chooses not to dwell on the effects of radiation (Perlman, Imaginal Memory and the Place of Hiroshima, p. 88). 78. ^ Tsuzuki, The Pursuit of Power in Modern Japan, p. 317. 79. ^ Gar Alperovitz’s 1965 Atomic Diplomacy put forward the ‘revisionist’ position that the primary motivation was not military but rather political: ‘dropped to impress the Soviets rather than defeat the Japanese’ (Walker, ‘The Decision to Use the Bomb’, p. 13). 80. ^ Cf. Gerson, Empire and the Bomb, p. 13. 81. ^ Peter Schwenger and John Whittier Treat, ‘America’s Hiroshima, Hiroshima’s America’, Boundary 2, vol. 21, no. 1, Spring 1994, p. 248. 82. ^ Hanna Segal, ‘From Hiroshima to 11th September 11 2001’, in Psychodynamic Practice, vol. 9, no. 3, August 2003, p. 257. 83. ^ Ibid., p. 261. 84. ^ Ibid., p. 263. 85. ^ Cf. Joseph Gerson’s Empire and the Bomb; see also Joseph Gerson, With Hiroshima Eyes: Atomic War, Nuclear Extortion and Moral Imagination, New Society Publishers, Philadelphia, 1995. 86. ^ Dwight Macdonald, Politics (August 1945), republished in The Responsibility of Peoples, Gollancz, London, 1957, p. 103. 87. ^ Ibid., p. 106.